Despite taking good care of your fish, diseases may still end up worming their way into the aquarium. They are often introduced when new fish are added. Read on to find out everything you need to know about fish diseases, aquarium hygiene and the right health checks when buying new fish. Also learn more about the most common fish diseases here. Poor living conditions, i.e. low-quality food, poor or unsuitable water values and an inappropriate environment, can weaken the immune system of fish. Social stress can also make the creatures more susceptible to disease. This is triggered, for example, when an aquarium is overstocked or one fish is ‘hounded’ or domineered by the others. Even mating displays and breeding can affect male and female fish. In many cases, when you introduce new fish into your aquarium you risk creating problems with fish diseases caused by parasites, bacterial infections, viruses and fungi. This makes it all the more important to ensure that any new aquarium inhabitants are healthy when you buy them. Is the fish behaving peculiarly? Does it have any visual impairments? Are all of its fins intact? The best way to buy fish with confidence is from pet stores or other reliable sources, e.g. from breeders. To play it safe when adding new fish, it is sometimes a good idea to use a quarantine tank. For aquarium fish, the term ‘quarantine’ means keeping fish in a separate tank with its own equipment, generally for several weeks, so that the fish can be specifically monitored and treated. However, this involves a great deal of work. Fortunately, it is rarely necessary to keep fish in quarantine if they come from a single reliable source. In fact, you should bear in mind that separating individual fish from your aquarium in the event of disease can even be counter-productive, as for most diseases the entire fish stock needs to be treated. Quarantine tanks are therefore intended for ornamental fish wholesalers, specialist retailers, experts and fishkeepers who soruce their fish from numerous suppliers. 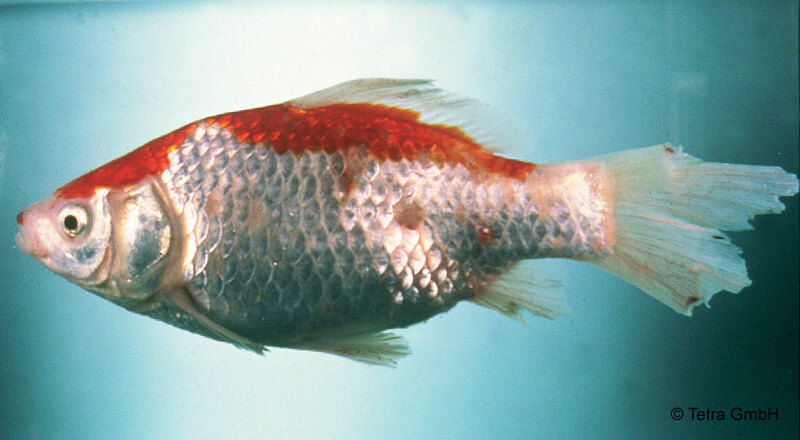 Fish diseases can spread quickly among the creatures in an aquarium. For this reason, aquarists should check the health of their fish daily as a routine matter of course. This also includes keeping an eye on their behaviour. Potential warning signs include any obvious changes, e.g. a thickening of or coatings on the mucous membrane, wounds, inflammations or frayed fins. If your fish already have bloated bellies, bulging eyes, large bloodshot patches or their scales are standing up, it is likely that they are in the advanced stages of a disease caused by a bacterial infection. Fish diseases should always be treated according to the specific problem. Avoid medical treatments if you are uncertain about the diagnosis. Sometimes, all it takes for the sick fish to become healthy again is to improve the living conditions. You can find suitable medication for most aquarium fish diseases in pet stores. However, it is important to come up with an accurate diagnosis. If you can’t find the information you need in the relevant literature, seek advice from a veterinary specialist. In many cases, the cause of the disease can only be clearly established by means of microscopic or special laboratory tests. Medicines must always be used in line with their instructions or according to veterinary specifications. Tip: in most cases, active carbon effectively removes the active agents from the water following treatment. It is also advisable to carry out further partial water changes every two to three days. Many fish diseases can be treated safely, but the focus should naturally be on prevention. The best solution is therefore to prevent fish diseases in the first place by naturally protecting your creatures against infectious diseases. When making new purchases, the following factors are particularly important: optimum water quality, hygiene conditions, species-appropriate animal care and stocking, appropriate filter care and a sufficiently large aquarium with a suitable fish stock. Problems caused by fish diseases can often be prevented in advance by feeding fish with top-quality brand foods and regularly checking the water values.